Many things can cause a rash in babies and children, and they're often nothing to worry about. These can be signs of meningitis. Use the information on this page to get an idea of what to do about a rash. But don't self-diagnose – see a GP if you're worried. A fever and a bright-red rash on both cheeks can be slapped cheek syndrome. Your child may have a cold, and the rash can spread to the body. It usually clears up within a week. Children's paracetamol can bring down a fever. Hand, foot and mouth disease is a common childhood illness that causes blisters on the hands and feet, and ulcers on the tongue. It also causes fever, and your child may have a cold. It usually clears up in about a week. Children's paracetamol can bring down a fever. Scarlet fever causes a pink-red rash, which feels like sandpaper and looks like sunburn. It usually starts with a swollen tongue, sore throat, headache and fever. See your GP straight away if you suspect scarlet fever. It's treated with antibiotics. Measles usually starts with a fever, sore eyes that are sensitive to light and grey spots inside the cheeks. After a few days, a red-brown rash appears on the head or neck and spreads to the rest of the body. 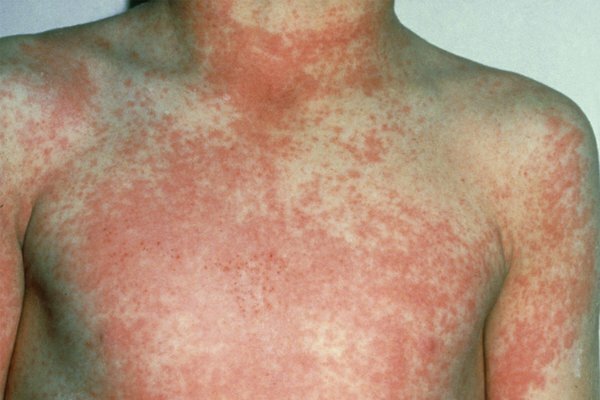 Call your GP if you think you or your child has measles. Heat and sweat can cause small red spots known as prickly heat or heat rash. It itches, so you may notice your baby scratching. Heat rash should clear up without treatment. 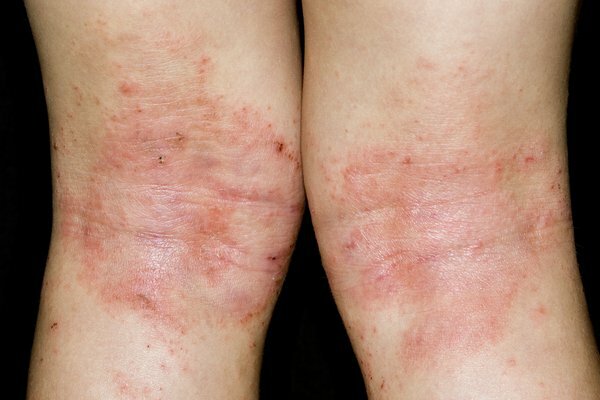 Skin that's itchy, red, dry and cracked may be eczema. It's common behind the knees, elbows and neck, but it can appear anywhere. Speak to your GP if you think your child has eczema. A raised, itchy red rash (hives) can appear as an allergic reaction to things like stings, medicines or food. It usually clears up within a day or 2. Speak to your GP if your child keeps getting this type of rash. They may be allergic to something. An itchy, ring-like rash can be ringworm. Ask your pharmacist for a cream or lotion to treat ringworm. Speak to your GP if it appears on your child's scalp, as it may need to be treated with medicine. Chickenpox causes red spots that turn to blisters. They can be itchy. They eventually scab and fall off. Some children have a few spots, while others have them all over their body. Red sores or blisters that burst and leave crusty, golden-brown patches could be impetigo. The sores or blisters can be itchy, get bigger or spread to other parts of the body. They often appear on the face, hands or around the middle of the body. 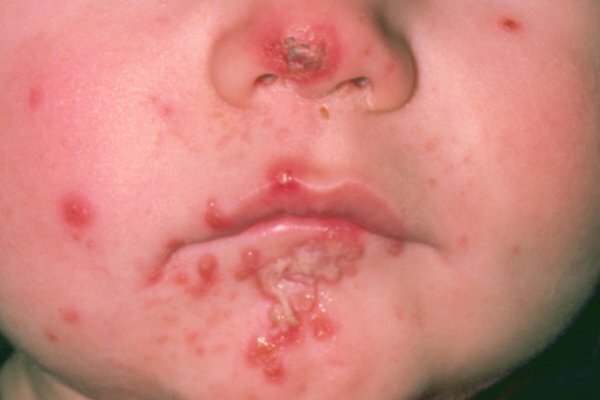 Speak to your GP if your child may have impetigo. Scabies is caused by tiny mites that burrow into the skin. Ask your pharmacist for a cream or lotion to treat scabies. Everyone in the household needs to be treated at the same time – even if they don't have symptoms. You should take your baby to a GP for advice if they are under 2 months old. Small white spots (milia) often appear on a baby's face when they're a few days old. They usually clear up within a few weeks and don't need treatment. 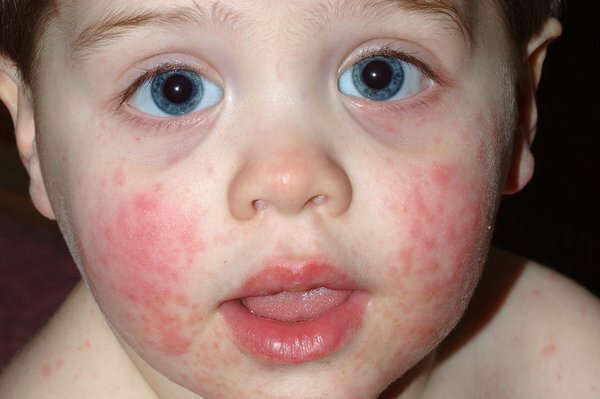 Raised red, yellow and white spots (erythema toxicum) can appear on babies when they're born. They usually appear on the face, body, upper arms and thighs. The rash can disappear and reappear. It should clear up in a few weeks without treatment. Small, firm, raised spots that can appear anywhere on the body are common in children and known as molluscum contagiosum. Treatment isn't recommended because the spots clear up on their own, although it can take more than a year. Nappy rash can be red patches on your baby's bottom or around the whole nappy area. The skin may look sore and feel hot. There may be spots or blisters. It can make your child feel uncomfortable or distressed. You can buy cream from your pharmacy to help clear it up. Baby acne can appear within a month after birth but usually clears up after a few weeks or months. Washing your baby's face with water and a mild moisturiser can help. Do not use acne medicines intended for older children and adults. Cradle cap is when a baby gets yellowish, greasy scaly patches on their scalp. It usually gets better without treatment in a few weeks or months. Gently washing your baby's hair and scalp with baby shampoo may help prevent more patches.